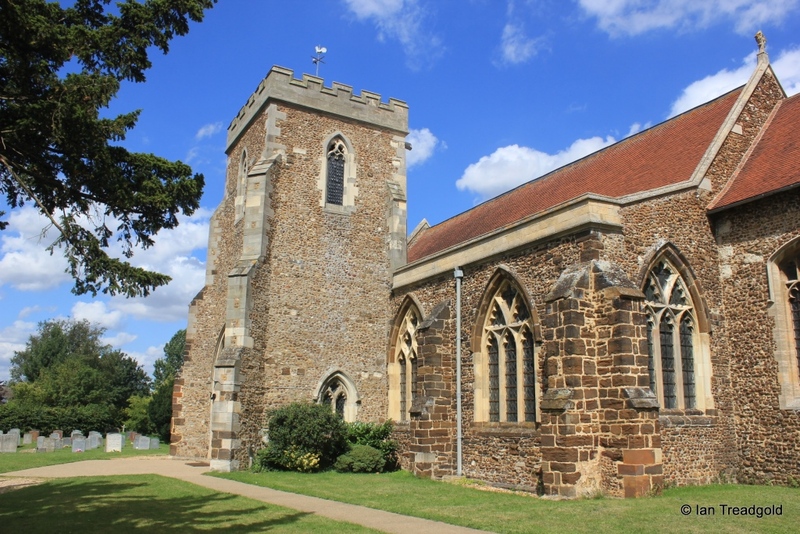 The church of St Andrew in Langford is situated in the northern part of the village, on Church Street. Parking is available outside the church. 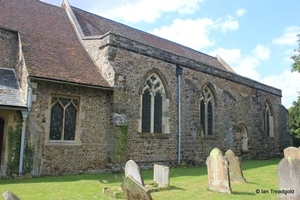 The church consists of a nave, chancel, north and south aisles, a vestry and organ chamber to the north and unusually a tower over the south doorway. 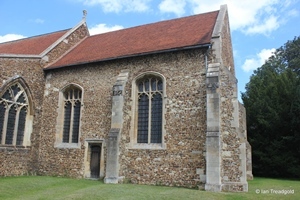 Whilst there is evidence of earlier buildings on the site, the bulk of the church dates to around 1320 although the chancel is older. 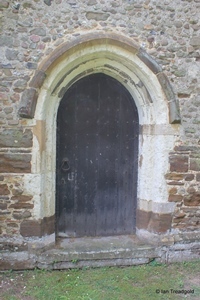 Restoration of the windows and doorways took place in C15 and further work was undertaken in C19. The nave roof was raised in 1874 giving it its present profile and the older pyramid roof of the tower removed in 1914. 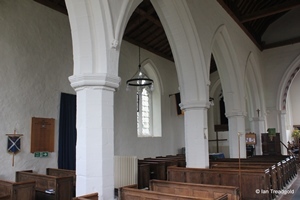 The chancel is around 33 feet by 17 with the nave adding around 58 feet by 19. The aisles add around 10 feet each and the tower over the south porch is about 11 feet by 10 and around 35 feet in height. 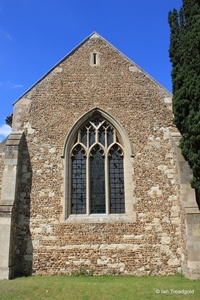 The south aisle has windows to the east and west and three windows on the south side with two to the east and one to the west of the tower. 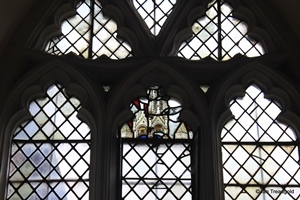 The east window and eastern window on the south side form the windows of the Lady Chapel and are similar in style being of three cinquefoiled lights with multifoil designs in the tracery above a transom under a pointed arch. 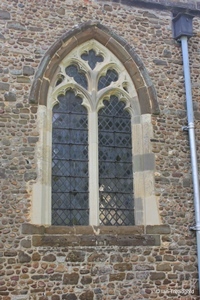 The east window has traces of medieval glass in the top of the centre light. 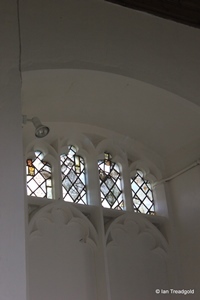 The windows surrounding the tower are also of three lights under pointed arches but have quatrefoil designs in the tracery. 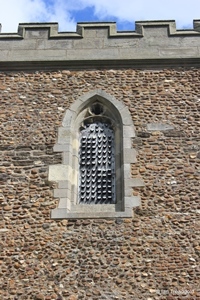 The window to the east of the tower also has fragments of medieval glass in the tops of two of the lights. The tower over the south doorway is an unusual feature for a parish church and adds distinction to this building. 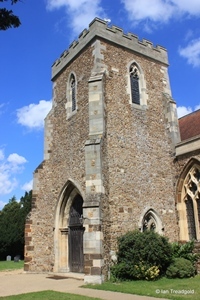 The tower is of two stages with single light belfry openings and is the only part of the church that is embattled. The eastern opening is almost of two lights with trefoiled heads but the central mullion is missing by design it would appear. The head has leaf tracery. The south belfry opening has a single cinquefoiled light with a circular multifoil design in the head. The western opening is again a single light but with cinquefoil tracery under an ogee head. The church bells are rung from the porch. The tower also has two windows to the east and west. 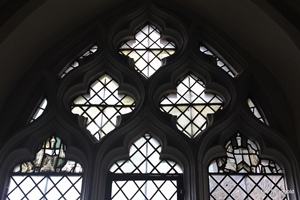 Both are two light cinquefoiled windows with quatrefoil designs above under two-centred arches. 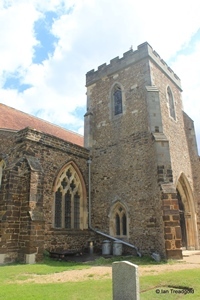 The west end of the church looks unusual because of the location of the tower. Most churches will have a west tower standing out from the aisles but here, the west end is flat across both aisles without even a west door. In appearance it looks like the east end of many churches. The west end also shows clearly the rebuilding that was undertaken when the roof of the nave was raised with a distinct line across the west end at the height of the arches of the windows. All of the tracery in the windows is modern. Without a tower as support, there are four buttresses across the with. 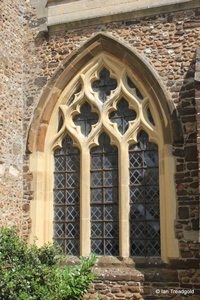 The west window of the south aisle is of two cinquefoiled lights with petal tracery above with a pointed quatrefoil design under a two-centred arch. 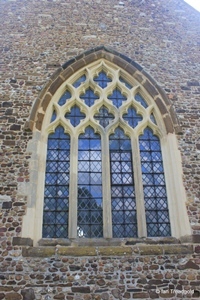 The main west window of the church is of four trefoiled lights with stepped archlets and quatrefoil designs under a two-centred arch. 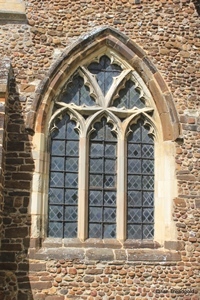 The west window of the north aisle is of two cinquefoiled lights with a quatrefoil design above under a two-centred arch. 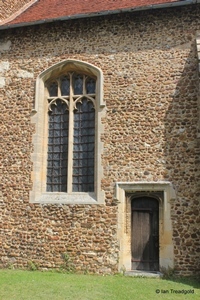 The north aisle has three windows to the north, one to the west of the doorway and two to the east. The western is similar to that at the west end of the aisle. 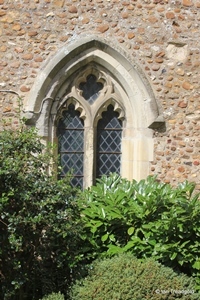 The two eastern windows are similar being of two cinquefoiled lights with curvilinear tracery above under a two-centred arch. The vestry and organ chamber occupy the north side of the chancel clearly having been added much later than the rest of the church. 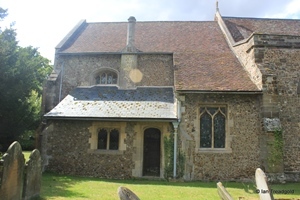 The sloping vestry roof cut the only north window of the chancel in two with only the head of four trefoiled lights remaining. 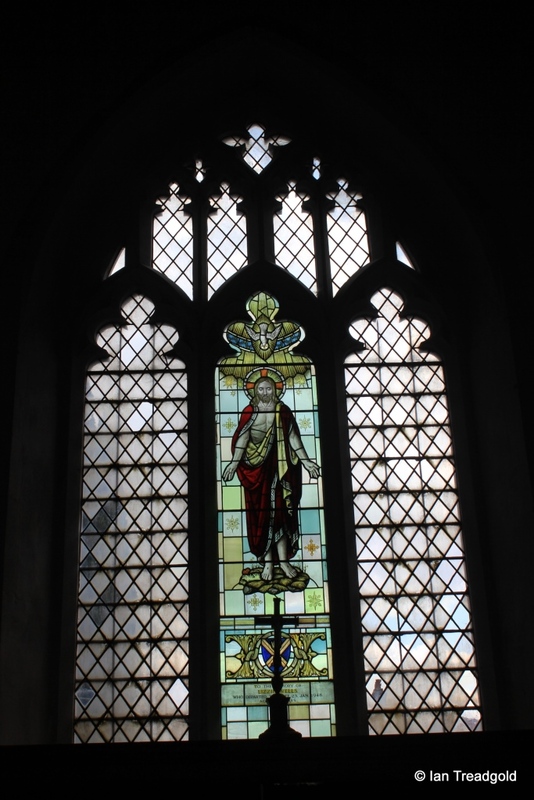 If the bottom portion of the window had retained its form then the window would be of two cinquefoiled lights with a mullion supporting the remaining lights like the remaining windows on the south side of the chancel. 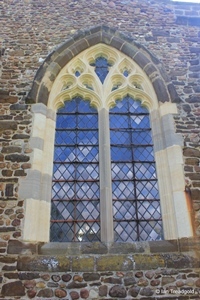 The east window is of three cinquefoiled lights with perpendicular tracery above under a pointed arch. 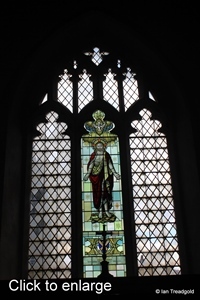 The glass in the centre light of the window depicts the risen Christ and was given in memory of Lizzie Wells of Kingsley Farm in Langford who died in 1948. 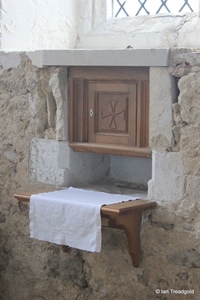 The south side of the chancel has two windows surrounding the priest’s door. Both are tall two cinquefoiled lights with perpendicular tracery above under four-centred arches. Both are tall two cinquefoiled lights with perpendicular tracery above under four-centred arches. 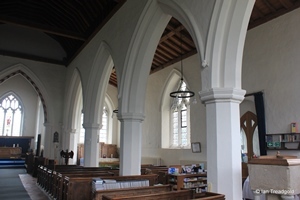 The two nave arcades are of four bays with octagonal columns giving the church a light and spacious feeling. 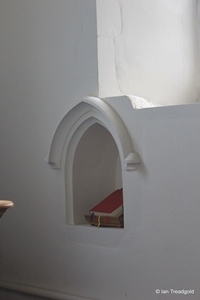 The Lady Chapel retains its piscina with an aumbry above whilst that near the main altar is used to hold a bible.